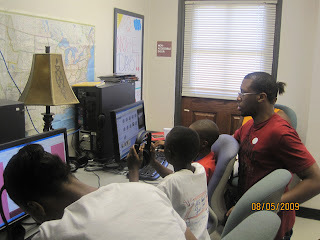 We haven’t even started the After-School Academy yet, but we’re already engaging the kids in great experiences! 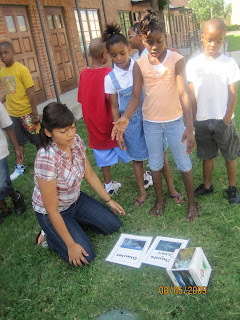 This past weekend, two of the kids were chosen to attend the Tulisoma South Dallas book fair. They met several authors, including Carole Boston Weatherford, who authors a number of great books you can find here and Derrick Barnes, who authors the Ruby and the Booker boys series. The kids also participated in a class where they watched a puppet show that took them in a time machine over to Africa and then were allowed to play some of the African drums and other instruments. Tulisoma is a free book fair event offered every year at this time. Plan to go with us next year! 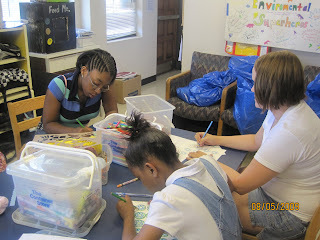 Friday, we had our annual back-to-school event at Roseland. 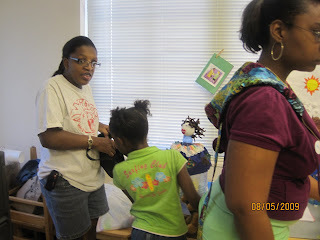 Lots of smiles, food, backpacks, face painting, jump houses, praise dancing, miming, and fun. 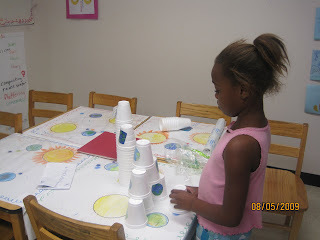 We recycle because this helps reduce trash. Things we recycle can be reused. We took the phones to Staples for recycling. I’m going to take my project to the gym for the environmental fair. Making the poster was fun. Working Hard For The Fair!!! I am really proud of the staff and the students. 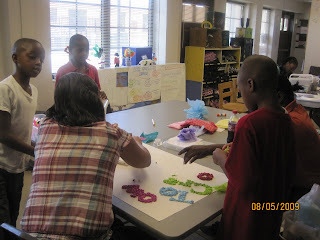 They have been working really hard preparing for the Environmental Fair. They have some great projects, videos, and oops!!! I am saying too much already. I can't wait until that day! I am excited to see what they will display. Today we had a very special guest from Texas Discovery Gardens. 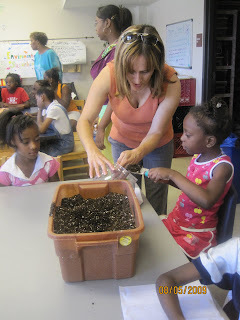 We learned about the differences between worms and catapillars. 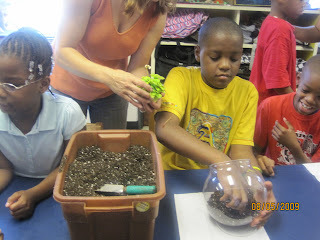 We also learned what a terrarium is and like humans, plants also need certain things to survive. Plants need sunlight, water, and air. 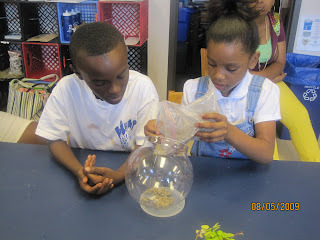 We sperated the program in to two groups and each group constructed a terrarium of their own. After we finished we took a break from learning about terrariums to play a game to help us better understand the water cycle. We pretended to be raindrops and make our way through the water cycle. The game consisted of roling a large dice and moving to a particular spot corresponding to what is on the dice. We realized that as raindrops most of us ended up in the clouds, lakes and rivers. Today was a very fun and eventful day. 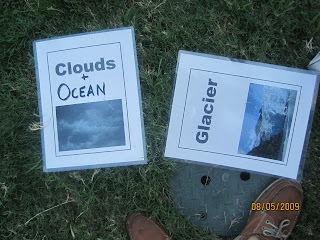 We learned a lot and have a lot of projects that we can now display at the environmental fair. The Young College Students Adventures!!! Today was a great day! We went to UTD in Richardson. Boy! it was fun! We started out by doing a mini-tour of the campus. They called it a mini-tour but by the time we circled the sites we were all sweaty and tired. 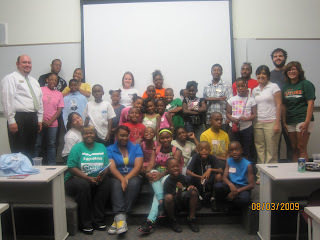 They kids really enjoyed the swimming area,the game room and most of all the student union. The student union was where all the good eating took place. We then retired at the conference area to enjoy a very hearty lunch, all provided by UTD. Those guys were outstanding!!!! After lunch the kids were polled with recycling questions. Not everyone had an answer but Ms. Lenice, Lewis and Janelle. They all received a prize. Our young ones were too full and tuckered out! I am standing on this fact, and that is why they could not respond! Ha! Ha! The day ended with smiling faces and full stomachs. They liked the presenters, they worked really well with the children. The kids did an outstanding job displaying how a college student should act in college. I am proud of them all!!!!!! !